We update our WCA Fundamental Conditions Barometer for October and consider what might be driving some of the recent pickup in equity market volatility. Evidence continues to mount that much of the global economy is coming under pressure. Last week brought news that China’s manufacturing sector worsened in October, along with output in September in South Korea,Japan, and Taiwan. A chill is also taking hold in Europe, evidenced by a halving of the third quarter growth rate, just as inflation is picking up.Emerging markets finished out October with losses, evidencing growing doubts about growth. 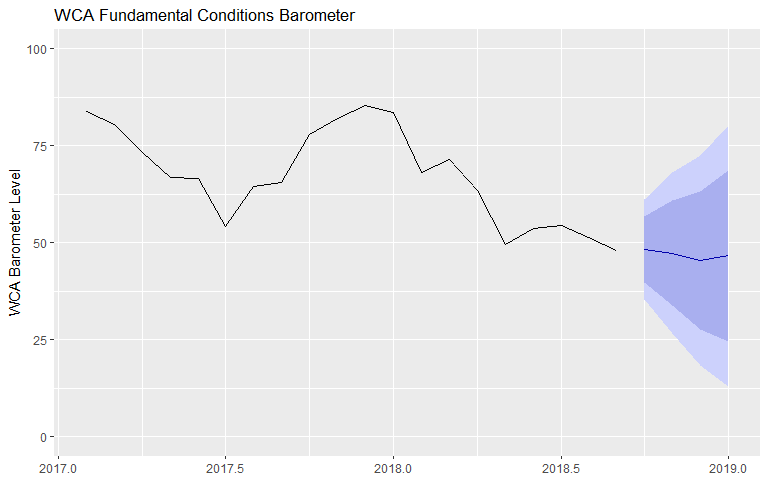 Our WCA Fundamental Conditions Barometer (graph, below) continued to tread water as a result of these factors. Given the near-50 level for the near-term forecast path of our barometer, tactical ETF allocations remain near neutral with respect to stock vs. bond allocations (versus an overweight position throughout most of 2017 and early 2018). What is Behind the Volatility? The decline in U.S. markets in October is enough to make anyone sit up and think about what might come next. It is natural to wonder if the Dow Jones Industrial Average’s (Dow) 2,400 point slide (about 10%) to 24,400 on October 26 from 26,800 on October 4 could signal the beginning of a more difficult period for stocks. We wrestle with these questions every day and keep coming back to a relatively simple answer, which is to follow our discipline. This discipline focuses on quality, value, and objective and timely analysis of information. During times of market stress, it is important to take a step back, take a look at the numbers, and not be afraid to take an action, but only if our process leads us to conclude some change is necessary. All investments involve risk, including loss of principal, and there is no guarantee that investment objectives will be met. It is important to review your investment objectives, risk tolerance and liquidity needs before choosing an investment style or manager. Equity investments are subject generally to market, market sector, market liquidity, issuer, and investment style risks, among other factors to varying degrees. Fixed Income investments are subject to market, market liquidity, issuer, investment style, interest rate, credit quality, and call risks, among other factors to varying degrees. This commentary often expresses opinions about the direction of market, investment sector and other trends. The opinions should not be considered predictions of future results. The information contained in this report is based on sources believed to be reliable, but is not guaranteed and not necessarily complete. Washington Crossing Advisors LLC is a wholly owned subsidiary and affiliated SEC Registered Investment Adviser of Stifel Financial Corp (NYSE: SF). The Dow Jones Industrial Average is an index that shows how 30 large, publicly owned companies based in the United States have traded during a standard trading session in the stock market.